One Injured In Multi-Vehicle Accident On Beeline Highway | Schuler, Halvorson, Weisser, Zoeller & Overbeck P.A. A multi-vehicle accident involving a tractor-trailer and at least one other vehicle has left a person critically injured. The accident closed one southbound lane of Beeline Highway. The wreck happened at the intersection of Indiantown Road and Beeline Highway in northern Palm Beach County, officials said. 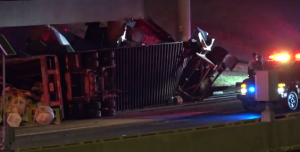 The driver of the other vehicle suffered critical injuries while the tractor-trailer driver suffered minor injuries. A female passenger who also sustained minor injuries was treated at the scene of the crash and released to go home. A witness described the crash as serious. Emergency services arrived shortly after the accident happened. Palm Beach County firefighters also responded to the crash. All first responders at the scene are doing their best to help the victims. One southbound lane of Beeline Highway is closed due to the severity of the crash, leading to major backups. Drivers are advised to use alternative routes.